AUSTRALIAN AERO CLUB, New South Wales, The Evening News Cup in highly polished 9ct rose gold, affixed atop the lid is a miniature model of a WWI Sopwith Camel plated with yellow gold and satin finish for contrast (85g; 12.5cm high), on the side is attached a winged kangaroo standing on a mound, above is inscribed, 'The Evening News Cup/New South Wales/Aerial Derby/Inaugurated 1920', and below the kangaroo is inscribed, 'Australian Aero Club/New South Wales Section', around the base is inscribed, 'Made by Angus & Coote Sydney'. Small dent in one arm, otherwise extremely fine and extremely rare. The Australian Aero Club was founded at Point Cook, Victoria on 6 November 1914 by instructors of the Central Flying School (CFS), Captain H. Petre and Lieutenant E. Harrison and the first officer aviators who obtained their pilot certificates at CFS, Captain T. W. White and Lieutenants R. Williams (later Air Marshall and first Chief of the Air Force and is widely regarded as the 'father' of the RAAF), D. T. Manwell and A. G. Merz. The Club had its inaugural meeting on 9 April 1915. After WWI a branch was formed in New South Wales with the inaugural meeting held at the lecture hall of the Royal Society on 5 June 1919. On Friday 1 October 1920 the Evening News, the first evening newspaper published in Sydney, from 29.7.1867 - 21.3.1931, with a Sunday edition published as Sunday News, from 1919-1930, published the following story. 1. The Aerial Derby shall be an annual open speed championship over a course about 100 miles or more in line, in length, either in a straight line, in a broken line or in a closed circuit, to be determined in advance. Aeroplanes competing in the Aerial Derby shall also be allotted handicaps, and an additional trophy is given for the best handicap flight in the contest. (1) A silver cup of the value of �120, to be held until the next annual contest. (2) A small replica of the cup in gold, valued at �50 to be his property. (b) To the entrant of the aeroplane which wins the handicap section of the contest. (1) A small replica of the cup in gold, valued at �50 to be his property. It was later announced that the Aerial Derby was to be flown on 27 November 1920 from Mascot aerodrome to Richmond and back. 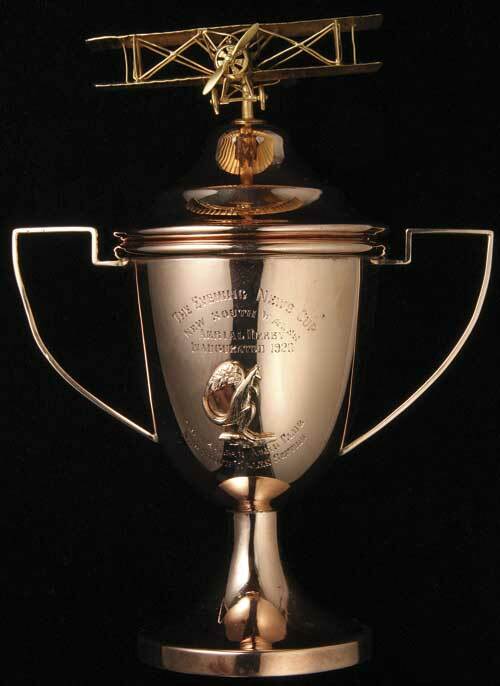 It was further announced that the Evening News Cup valued at �120 was to be manufactured by Angus & Coote of George Street with all Australian material and workmanship, the silver of which came from Broken Hill and the plinth of Australian maple and also that replicas of the cup in gold valued at �50 each were to be made. There were nine entrants in the inaugural race in 1920 which was won by Captain G. C. Matthews in a Sopwith Gnu. To generate publicity for the event, Captain Matthews carried a passenger, Miss Dorothy South, an American stage actress who was in Sydney to appear at Her Majesty's Theatre in the stage play, Irene. Miss South also carried as a mascot a little Pomeranian dog. The handicap section of the race was won by Lieutenant Nigel B. Love. Trophies were presented by the Club President, Lieutenant Colonel Oswald Watt, a legend of the Australian Flying Corps in WWI. Six months later on 21 May 1921 Watt was drowned at Bilgola Beach, one of Sydney's northern beaches. The second Aerial Derby was held on 6 May 1922 with eight entrants. One of these was a Queensland Northern Territories Air Services Ltd, (later QANTAS), Avro Triplane flown by Hudson Fysh (co-founder of the company and flying this aeroplane which was one of the companies 4-seater passenger planes). This race was held at Victoria Park Racecourse, Zetland, an inner-city suburb near Mascot, with spectators being able to see the entire race as the planes departed from the racecourse to a mark at Botany Pier, then to a mark at Maroubra tram terminus and back to the racecourse, making a total of five circuits of this designated course. The winner was Captain Nigel B. Love flying an Avro Baby which was the actual machine used by Bert Hinkler in his famous London-Turin non-stop flight and Sydney-Bundaberg flight and was also a competitor in the London Aerial Derby in 1920, coming second. Captain Love also won the handicap section of the race. Thus, only four gold replica cups have been awarded, one to Captain G. C. Matthews for winning the inaugural 1920 Aerial Derby and three to Lieutenant (later Captain) Nigel B. Love who won the inaugural 1920 Aerial Derby Handicap and in the second Aerial Derby in 1922 he won the event and was also Handicap winner. Where are the four gold replicas? Were any melted for their gold value? As the cup offered here has the inscription 'Inaugurated 1920' it must be assumed it was one of the two awarded for the first race held in 1920. Presumably the second race held in 1922 would have mention in the inscription that it was awarded for the 1922 race. Therefore the cup offered in this lot must be one of only two with the inscription 'Inaugurated 1920' and one of only four of this design. Extremely rare and an outstanding relic of Australian aviation history, perhaps the only one in existence today.